Peter the Venerable (c. 1092 – 25 December 1156), also known as Peter of Montboissier, abbot of the Benedictine abbey of Cluny, was born to Blessed Raingarde in Auvergne, France. He has been honored as a saint but has never been formally canonized. The Catholic Church's Martyrologium Romanum, issued by the Holy See in 2004 regards him as a Blessed. Peter was "Dedicated to God" at birth and given to the monastery at Sauxillanges of the Congregation of Cluny. He took his vows there at age seventeen, swiftly rising in esteem and becoming professor and prior of the monastery of Vézelay at only twenty years of age. Later he went to the monastery at Domène. He was so successful in the fulfillment of his duties at Vézelay and Domène that, by the age of thirty, he was elected general of the order. Peter was a tireless advocate of reform within his order, which was in dire need of reconstruction after the deposing of the previous abbot, Pontius, by the pope. The Congregation of Cluny was also under attack by other orders and prominent monks and theologians, including St. Bernard of Clairvaux, a Cistercian monk. Successfully defending his order against these attacks and completely reforming it, Peter earned the appellation of "venerable". Peter became a popular international figure and an associate of many national and religious leaders of his day. He attended many of the important religious councils of his generation, including the Council of Pisa in 1134, where he helped to avert a potential schism in the Church by supporting the cause of Pope Innocent II, and the Council of Reims in 1147. In addition, he defended French theologian Peter Abelard after the latter’s rationalistic Trinitarian interpretation had been condemned by the Council of Sens. He granted Abelard hospitality at Cluny and worked to mitigate the sentence of the council, eventually reconciling Abelard with his principal condemner, St. Bernard of Clairvaux. After Abelard's death, Peter granted him absolution from his sins, at the personal request of Heloise. Peter is well known for collecting sources on and writing about Islam (see below) and also as the author of vast amounts of correspondence, reflecting his almost encyclopedic knowledge of theological questions. His writings are counted as some of the most important documents of the 12th century. He took a long sabbatical journey to Spain to study with Islamic scholars of all ranks and published the first Latin ion of the Koran. His Talmudic contributions are tenuous and still under scrutiny. Peter's true brilliance came to light between 1138-1142, especially after his translation of the Koran became required reading to the entire Benedictine world and for all preachers of the crusades. Peter corresponded with Bishop Henry of Blois of Winchester and Glastonbury who became one of his closest friends and confidants. Peter was well known for his ability to win debates. 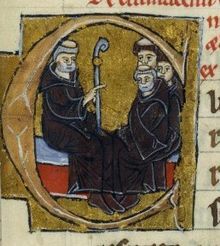 The internecine truce between Peter and Bernard of Clairvaux must be seen as superficial in light of recent scholarship detailing the repressivness of Bernard's Cistercians toward the Cluniacs. Peter the Venerable died at Cluny on 25 December 1156. His works are ed in Patrologia Latina vol. 189. Peter used the newly translated material in his own writings on Islam, of which the most important are the Summa totius heresis Saracenorum (The Summary of the Entire Heresy of the Saracens) and the Liber contra sectam sive heresim Saracenorum (The Refutation of the Sect or Heresy of the Saracens). In these works Peter portrays Islam as a Christian heresy that approaches paganism, and he explains to St. Bernard that his goal is "ut morem illum patrum sequerer, quo nullam unquam suorum temporum vel levissimam (ut sic dicam) haeresim silendo praeterirent, quin ei totis fidei viribus resisterent et scriptis ac disputationibus esse detestandam ac damnabilem demonstrarent." That is, "that I may follow the custom of those Fathers, who passed over no heresy in silence ever, even the lightest (as I will thus call it), but rather resisted it with all the strength of their faith, and showed it, through writings and arguments, to be detestable and damnable." While his interpretation of Islam was basically negative, it did manage in “setting out a more reasoned approach to Islam…through using its own sources rather than those produced by the hyperactive imagination of some earlier Western Christian writers.” Although this alternative approach was not widely accepted or emulated by other Christian scholars of the Middle Ages, it did achieve some influence among a limited number of Church figures, including Roger Bacon. At his weekly general audience in Saint Peter's Square on 14 October 2009, Pope Benedict XVI used Peter as an example of compassion and understanding, citing Peter's governance of Cluny, diplomacy, and study of Islam. ^ Pernoud, Régine (2000). Those terrible Middle Ages: debunking the myths. San Francisco: Ignatius Press. p. 135. ISBN 978-0-89870-781-6. ^ J. Kritzeck (1964). Peter the Venerable and Islam. Princeton: Princeton University Press. p. 14. ^ R.W. Southern (1962). Western Views of Islam in the Middle Ages. Cambridge: Harvard University Press. p. 37. ^ Letter of Peter the Venerable to St. Bernard of Clairvaux, from Giles Constable, Letters of Peter the Venerable, 2 vols. (Cambridge, Massachusetts: Harvard University Press, 1967), Letter 111. ^ Hugh Goddard (2000). A History of Muslim-Christian Relations. Chicago: New Amsterdam Books. p. 95. Constable, Giles. Letters of Peter the Venerable, 2 vols. Cambridge, Massachusetts: Harvard University Press, 1967. Goddard, Hugh. A History of Muslim-Christian Relations. Chicago: New Amsterdam Books, 2000. Peter the Venerable Against the Inveterate Obstinacy of the Jews, translated by Irven M. Resnick. Washington D.C.: The Catholic University of America Press, 2013. Peter the Venerable Writings Against the Saracens, translated by Irven M. Resnick. Washington D.C.:The Catholic University of America Press, 2016. Kritzeck, J. Peter the Venerable and Islam. Princeton: Princeton University Press, 1964. Microsoft Encarta. 2005 ed., s.v. "Peter the Venerable." Southern, R.W. Western Views of Islam in the Middle Ages. Cambridge: Harvard University Press, 1962. Kenneth Stevenson, "The Transfiguration Sermon of Peter the Venerable, Abbot of Cluny," in Melanie Ross and Simon Jones (eds), The Serious Business of Worship (London, Continuum, 2010), 78-87.